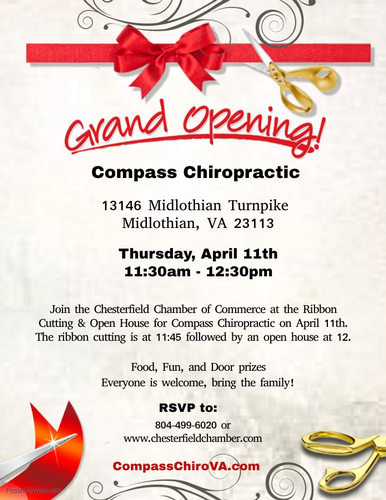 Please join us at Compass Chiropractic for our ribbon cutting (11:45) followed by our open house (12:00-12:30). Located in the Village Marketplace Shopping Center, right next to the Prairie Grain Bread Company. Door prizes and food will be provided. Families and children are welcome to attend. Grand Opening Celebrations: 12 p.m. to 12:30 p.m.